Chop onion in food processor to a puree. Fry onion (dry, without oil) in pan on medium high heat and add nutmeg, oregano and pepper. Cook for 5-10 minutes until onion is slightly brown. Add meat and brown on low heat for 25-30 minutes stirring occasionally. Smash cream cheese and feta with a fork on a plate to soften and blend the cheeses together. Melt butter and oil in a saucepan over medium heat. Cut filo in half horizontally so that the sheets are 12 x 8.5”. Wrap half the filo and place in refrigerator so that it does not dry out. Filo dries quickly so you need to work at a fast pace. You can also place a lightly damp cloth over the filo sheets to prevent the sheets from drying out. 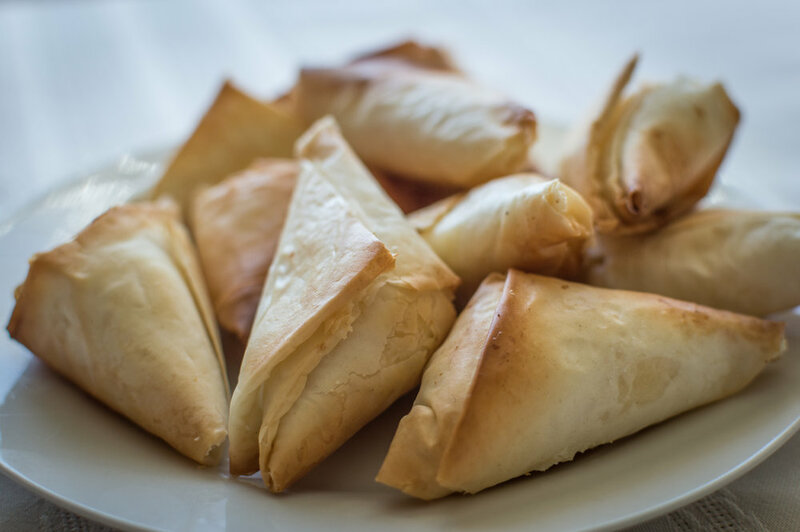 Take one sheet of filo, lay it out landscape in front of you and lightly brush with the melted butter. Fold the sheet in half, brush lightly with butter and fold in half again, brush top with butter. Place one teaspoonful of cheese on one end of the filo strip about 2 inches from the end. Fold end of filo over onto itself in the shape of a triangle, partially covering the cheese. Continue folding the filo onto itself, keeping the triangle shape and folding lightly so that the cheese is not pressed. When you get to the final fold, lightly brush the end with butter to seal the final fold. Place folded triangles on baking sheet. Brush the tops lightly with butter and bake in the oven at 350 for 20 minutes or until they are golden brown.